According to Miller & Veatch (2011), Cornell Notes are the process of "note making" as opposed to note taking. Note taking refers to notes being recorded while listening to a lecture, while note making is the process of summarizing a text in a note format. To the right, an image shows the format of Cornell notes, with key words and main ideas written on the right, with key questions written in the right column after notes are finished being taken. After finishing the reading, students summarize their notes and findings at the end of their Cornell notes. Using Cornell Notes as a comprehension strategy has been found to increase "engagement with and understanding of concepts within the text" (Yamamoto, 2007). Cornell Notes are an Advanced Via Individual Determination (AVID) strategy that teaches students strategies they will need in their future to be ready for both high school and college. Teaching students the benefits of making notes via the Cornell Notes method will provide students with the skills needed to increase their competition while reading any type of text (Nickerson, 2011). Students that use Cornell Notes have increased comprehension, resulting in higher-level questioning and higher academic performance (Jacobs, 2008). The video above shows a teacher instructing the viewer on how to take Cornell Notes. She talks about the benefits and the steps to take to do when making Cornell Notes. This video would be beneficial to keep accessible for students who many need a review of how to do Cornell Notes throughout the year, or if they are struggling with the concept of Cornell Notes. The video to the right is an instruction video by middle school students. The students describe how they set up their notes and how to know what to write down in their notes. The student perspective can be encouraging to students who watch the video and because the student is physically setting up the notes it provides a step by step tutorial to making Cornell Notes to improve comprehension. The students also provide examples of what to write within the notes. How can I use this strategy in a middle school? Cornell Notes are most often used with expository texts, but is a strategy that can be used with any type of reading. This comprehension strategy is a tool that can be used across content areas and can benefit students in any class. There are many ways Cornell Notes can be used in middle school. One way Cornell Notes can be used in a History classroom is to have students use this note making strategy to identify key events and ideas in the text's chapter. History textbooks are often full of difficult academic language and vocabulary, making it difficult for students to comprehend text. Asking students to summarize the text and note main ideas and questions will increase their comprehension. Another way Cornell Notes can be used in the classroom is in the English classroom with fiction texts. Though Cornell Notes are most often used with expository, non-fiction texts, they can also be used with fiction texts. Students can analyze more difficult novels using this method to deepen their understanding of the story and identify main ideas and details. Summarizing the text ensures students reflect and review what they have read. Cornell Notes have a writing component and meets writing standards. The notes incorporate writing as students are making their notes. Students must identify data and find evidence to identify main ideas and details of a text to demonstrate their understanding of the text (CCSS 6-8.1B). Students must also summarize their reading and notes they made to support the information presented in the text (8-8.2F). The video to the left is a detailed video from AVID, supporters of Cornell Notes, that focuses on preparing students for college readiness and success in society. The video encourages viewers to take Cornell Notes on the video, which gives students guided practice in making Cornell Notes. This opportunity gives the teacher a chance to look at the main idea and details students find in the text and identify students who may need additional support. It also provides the chance to show students that everyone's Cornell Notes will look different, but that is okay. 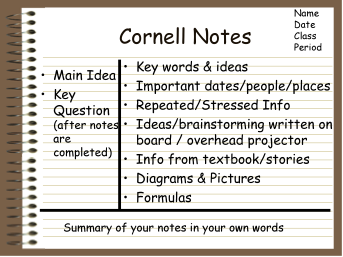 -This resource provides Cornell Note templates to get started. -This resource provides an outline for Cornell Notes that can be used as an anchor chart. -This resource shows the note making stages of Cornell Notes.